Today’s Autumn Statement highlights just how much progress this Government has made. Project Fear has been shown to be a phantom: This year Britain is set to remain the fastest growing economy in the G7! And next year we are likely to grow as quickly as Germany and outpace both France and Italy. What’s more, the fastest growing region of the UK was the North East, the fastest pay growth was in the West Midlands, and every region recorded a record high employment rate. This Conservative Government has moved away from the London-centric economy built under Labour and opened up the powerhouses of the North. There is still a great deal of work to do in improving education, reforming welfare and cutting business taxes and I would have liked to see further announcements around mental health but, on balance, our country is undeniably better placed now than it was six years ago. The message that rang out true and clear across the whole Statement was that Britain is open for business and we saw welcome progress on tax cuts and investment that should reassure investors and businessmen. In some ways I was disappointed that the Chancellor didn’t list all the measures to the House of Commons because, as Chair of the All Party Group on Financial Technology (FinTech), it was great to learn that £500,000 has been put aside for a ‘State of UK FinTech’ report for investors and a network of regional FinTech envoys. This will further entrench the UK as the best place in the world to base an HQ for a finance or financial technology business. Leaving the EU offers a fantastic opportunity to deepen partnerships between the UK and the rapidly growing economies of Africa and Asia. As the Prime Minister’s Trade Envoy to Ghana I was delighted to see that the Government is doubling the money available for UK Export Finance (UKEF). Also contained in the small print of the Autumn Statement was an increase in the number of pre-approved local currencies to which UKEF can offer support. Reforms such as these give British businesses the crucial tools they need to export across the whole world. I have long thought that the National Insurance thresholds for employers and employees should be aligned, so this simplification measure is a welcome step forward. I very much hope that the Chancellor will go further in cutting and simplifying taxes for businesses in the future. For example, at the last Budget it was suggested that the Government would look at merging National Insurance with Income tax and it’d be great to see that happen sooner rather than later. The Prime Minister announced her backing for increased investment in science and technology to the tune of £2bn a year by 2020, and it was good to see this fleshed out in the Autumn Statement. The Chancellor rightly pointed out that increasing spending does not always translate into increased services. Nevertheless, investment spending in science and technology must be singled out as a great way in which we can boost our economic growth and create jobs for the long term. So this Autumn Statement was good news for the scientific research sector, recognising the need for reassurance that the Government will make up any lost funding from the EU and that this will be new money, not simply pilfered from the existing science budget. This Conservative Government has promised to increase research & development (R&D) funding by 20%, a higher percentage increase than any Parliament since 1979. The Government is also looking at ways to reform R&D tax credits to make the UK an even more competitive place to do scientific research & development. The Statement also laid out in detail the money that the Government is putting aside for autonomous vehicles, a transport revolution that will transform the way people commute particularly in cities. Finally, the Chancellor mentioned digital communications, specifically how making the UK a world leader in 5G will give Britain a cutting edge as we move to an age of increased self-employed digital and IT focused professions. § The progress HMRC has made on merging National Insurance with Income tax. § The progress that the Government has made on mental health. § Further support for specific high-tech areas such as artificial intelligence. § What progress the Government has made on deregulation. § Whether there will be greater cuts to Corporation Tax. The fundamentals of our economy remain strong, the budget deficit is predicted to continue to fall in each year of this Parliament and sit at 0.8% in 2020/21, compared to 12% in 2010/11. 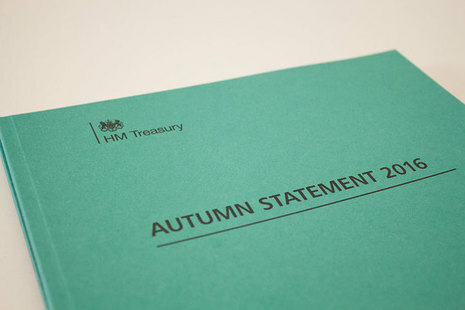 Moving the budget to Autumn is another eminently sensible move which will enable taxpayers and businesses to enjoy great confidence and certainty about the decisions they make throughout the year. In essence I believe this was a confident budget, from a confident Government and a Chancellor that is cautiously confident about the future.